The following interview with Libyan businessman Hassan Tatanaki was conducted a few days before the sudden events took place in Libya. The General National Congress (GNC) was surprised by the military deployment led by retired Maj. Gen. Khalifa Hifter in Benghazi, Tripoli and other areas. This operation was supported by sectors of the army and has pushed the GNC to announce, in a shocking step, the election of a new parliament on June 25 to replace the GNC, whose term has expired. Libyan businessman Hassan Tatanaki talked to Al-Hayat about the necessity of forming an emergency government in Libya to strengthen the army, police and judiciary, before the country becomes a source of terrorism. The elections may not be held on schedule because the events on the ground keep changing around the clock. Meanwhile, neighboring countries are closing their borders to people, the Arab League is taking action and the Maghreb countries are calling for a meeting to discuss the developments in Libya. For their part, the United Nations, the United States and Europe are watching with a great level of suspense. Tatanaki said that Islamic political parties were controlling the GNC after they had received the consent of Western circles and became powerful. However, he considers Libya’s problem to extend beyond this, as developments reveal a desire to turn this country into a hotbed of terrorism. Tatanaki said he is optimistic about the ability of the Libyan people, with all their revolutionaries, armed forces and tribes, to overcome chaos and deter extremist leaders that are striving to spread discord between the tribes and across the cities. He suggested the creation of an emergency government monitored by an elected parliament to enhance the army, the police and the judiciary, and respect the responsibilities of the tribes as per their customs, for deterrence. This leads to getting rid of illegal weapons and makes people trust the state security institutions and the judiciary. As a political activist, Tatanaki said in all transparency that he helped close associates of the regime in solving the problem of the blockade resulting from the Lockerbie problem. Back then, the regime of former President Moammar Gadhafi considered him a close associate of the United States and some European countries. Some Gadhafi supporters even accused him of collaborating with these countries. Al-Hayat: Revolutions breed chaos while waiting for the crystallization of the national political system, and in the case of Libya, this is taking some time. There are concerns plaguing both the domestic and the regional arenas. Why is the process taking so long? Is it a natural or intentional delay? Tatanaki: The GNC’s term, as per specialized observers, has expired, but the political Islam parties’ control of the GNC and their disrespect of the people and the state explains their survival and the survival of the GNC. It’s like they’ve kidnapped the state by impeding the establishment of new post-revolutionary institutions. The GNC is invalid now, despite the fact that foreign countries believe it is. Had a similar act occurred in a foreign country, the involved people would have been referred to courts. The control of the GNC, the weakness of the government and the presence of militias are all factors that lead to a dictatorship project with an imaginary entity called political Islam. They are trying to control the state departments and employ their supporters in the joints of public departments and institutions, although they are a minority, and they are doing so through pressures that the Libyans are aware of, including direct and indirect threats. At the popular level, these people do not enjoy great support, but they engage in inhumane behavior and political games that cannot be afforded by the post-revolution phase of state construction. For example, they push some of their figures to the forefront and present them as independent. Al-Hayat: The Islamic political groups are losing in the Libyan post-revolution referendums, but they are clinging to power positions, sometimes with the consent of major foreign countries. Tatanaki: Western leaders consider what happened in Egypt and is happening in Libya as a natural matter. According to them, the Brotherhood is a religious and social movement that has a political framework connected to the demands of the people. These leaders cannot distinguish between the Muslim Brotherhood and the conservative religious education of the people. There is quite a difference between the two. The Brotherhood is a political movement; it does not include people specialized in religious sciences and guidance. The Muslim Brotherhood’s relationship with religion is neither solid nor unreliable. Their leadership does not include specialized clerics because most of them are engineers and doctors, among other civil disciplines. They just grow beards and take themselves for guardians of Islam. Some European presidents have shallowly supported the Brotherhood in a bid to let Muslims solve their own problems internally, but did they really leave us and abstain from interfering in our affairs and supporting the Muslim Brotherhood? There is no doubt that this is a game that goes beyond Libya’s border and spreads in the region. The great potential and discourse of the Brotherhood and their allies in Libya goes beyond their need to take control of Libya alone. There is more to it. [They] want to turn Libya into a platform and a source of terrorism given its strategic location. Terrorism is being practiced under the banner of Islam, although in actuality it has nothing to do with Islam. Al-Hayat: Does tribalism in Libya constitute a real obstacle to the crystallization of the new Libyan state? Tatanaki: There are extremist leaders who exploit individuals in tribes for sedition purposes and in a bid to tighten their control, but the Libyan people communicate among each other, and there are no fundamental problems between the tribes. We have more than a hundred tribes, and there are only limited problems among a small number of them, and this is normal in any society in the world. Some Islamic movements provoke tribal disputes in an attempt to create baseless conflicts for sedition purposes. During the era of Gadhafi, the popular bases of the tribes were interrelated, and Gadhafi only controlled some of the leaders of these tribes. However, one should always be cautious. When blood starts to flow, it is hard to stop it. We are still at the beginning, and it is easier for us to prevent a torrent of blood on the hands of sedition-seekers who only care about control. There are no broad affiliations to political Islamic organizations in Libyan society. The percentage of those who have certain affiliations does not exceed 5%, knowing that their affiliation is tribal, regional and national, and they are all Muslims. Tribalism leads to the [building of the] state. It does not hinder the process, but there are people who sow discord among tribes, especially in the western regions. Misrata, as a revolutionary city, originally derived its strength from being an economic city. 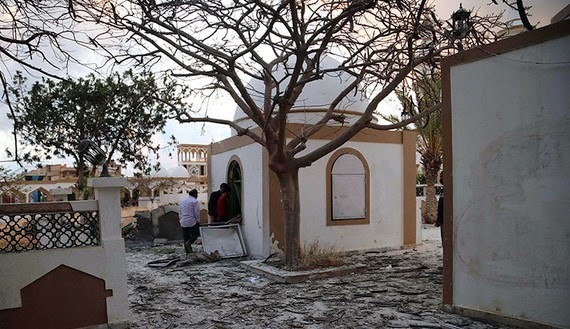 The actions of some people who are sympathetic toward the Muslim Brotherhood have led to the emergence of discord among the people of Misrata and those of Benghazi. It is as if they are taking Libya toward a greater strife. Are these actions aimed at dividing Libya as a country — not as a people — and distributing the resulting parts among the neighboring countries? There is no other explanation for such seditious behavior. In a matter of months, if Libya does not get stronger, i.e., if the entire state is not strengthened, it will face grave risks, which may probably include foreign strikes. The Islamist groups have an irresponsible sense of nationalism and do not believe in the national borders of the state. Al-Hayat: What is the truth behind the rumors that the revolution began in eastern Libya and was delayed in other areas? Tatanaki: The citizens started the Libyan revolution, which began at the same time in all of the regions, with different potentials and conditions. The movement has emerged in Benghazi, as a result of the significant marginalization the city suffered from under the Gadhafi rule, where the military presence of its residents was limited to the Saeqa forces, led by Abdel-Fattah Younis, which defected against the regime. These conditions have encouraged the street movement in Benghazi. On the next day, Tripoli was mobilized. Yet Gadhafi’s reaction against it was harsher, given the heavy presence of his forces in the capital. As for the just demands of the people of Cyrenaica, we must distinguish between the federation and partition. The decentralization is probable, yet it does not imply the partition that is being promoted by some, most notably the Brotherhood. In fact, the decentralization is positive in a vast country, and the Libyan people are the ones who decide on this issue, after a good explanation prior to the referendum. The partition of Libya is undoubtedly a greatest treason. As for the form of the administration, it is put to the referendum. Al-Hayat: There has been a tendency by the ruling forces to keep intellectuals who immigrated abroad at a distance, what do you think about that ? Tatanaki: It is negative behavior that a person accepts to be kept away or that he excludes himself. We are continuing our battle for a better future for Libya, and the overthrow of the Gadhafi rule was just the first round. Al-Hayat: Is there any coordination with the Libyans living abroad to support the revolution and the new institutions? Tatanaki: There are superficial contacts. Yet, in Libya, without any exception, we lack the culture of a team to resolve the crisis. We have been working so far as individuals and entities. The fear for the country has not reached out to our deep thinking, although it is a critical situation. The direct preliminary ideas are the ones prevailing, even though some of them are practical and beneficial. Al-Hayat: What do you think about the reconciliation slogan that Islamist groups have repeatedly raised? Tatanaki: Actually, there are no major problems among the people, the tribes or between cities. There are individual acts, and the Brotherhood is creating and spreading a problem, although it is individual and can be solved by itself. They address those who left Libya and ask them to come back, without providing them with safety. Al-Hayat: What about the Libyans who live abroad and were in positions of responsibility under the Gadhafi rule? Tatanaki: It is necessary to prosecute senior officials and not junior employees or soldiers, [or else it would be similar to] the prosecution of a whole tribe for the actions of its leaders or some of its leaders. It would be similar to the prosecution of Libya as a whole for the Lockerbie bombing, or the prosecution of the Libyan people for the actions of Gadhafi. Al-Hayat: In your opinion, what are the limits of political isolation? Tatanaki: In principle, I support it, if it deals with senior officials under the Gadhafi rule, considering that they pledge loyalty to the dictator. Yet, there are two problems. The first is related to the stages when these officials were appointed. The second one is linked to the positions they held. The Gadhafi rule went through different stages. It depends on the position and the stage. It is to be noted that in the 1980s, the appointments were based on the loyalty to the revolutionary committees. There is no generalization in this regard. It is not necessary now to employ those who ruled under the Gadhafi rule; if some of them were subject to injustice, it is not a problem. In fact, taking part in the governance under the Gadhafi era is an experience in bad governance. So, if employed, they will do us no good. We can forgive them, but cannot employ them. I believe one cannot be forced to do a specific job unless threatened with death. The courts will decide the matter. In any way, there are enough men and women in Libya to employ and spare the country the return of former officials of the Gadhafi rule. The Brotherhood pledged allegiance to Gadhafi in 2005 and 2006 (Gadhafi and Saif al-Islam Gadhafi). The Brotherhood did so and did not participate in the government, which is why they were not isolated politically. The number of businessmen, especially tradesmen, is high, as in any other country. Yet, there are individuals who were supported by the authorities to create economic entities. Suddenly, an employee would be possessing $50 million, which will certainly raise questions about the source. Yet, all these people must be provided with a fair trial at all times. Before anything else, the country needs a police, an army and a judiciary. When these departments serve the state, they will stabilize it, knowing that it cannot be built under a lack of security and the presence of corruption. Al-Hayat: Are the Arabs and the world aware of how serious the situation is in Libya today? Tatanaki: We need to be wary of any foreign intervention that could result from the actions of an extremist current. The innocent Libyan people will be paying the price. A military intervention in a foreign state needs a justification that they will find in the mistakes committed in Libya. In general, our people are emotional and quickly forget. The issue of the US ambassador who was killed in Benghazi is not over yet. In Washington, they have not forgotten that, because for them, time explains the problem and doesn't solve it. Years have passed before the Lockerbie issue was solved, after the Libyan people had suffered financially because of the siege imposed on the country. Al-Hayat: In your opinion, what solution is required for Libya? Tatanaki: Building the institutions of a unified state. It is unavoidable to form an emergency government that is monitored by parliament, that withdraws the weapons [from militias], develops the police, the army and the judiciary (uses the tribes to assume the responsibility of tribal militiamen and apply the norms to deter them). A fair judiciary is needed, because an activated judiciary is equal to an army and a police. Without it, we would have laid the foundations of a new barbarism. We can also seek the help of foreign technical expertise. When it comes to the cadres, we have enough Libyans and capable cadres that can be employed. I am not talking about leaders, but engineers, technicians and administrators. I would like to note the proper use of resources, and permanent awareness of the damage caused by the prevailing corruption in most of the sectors. I raise the slogan of “every citizen is a watchman,” which means that citizens will take the initiative of contributing to the social, economic, political and administrative security. This is in addition to the promotion of good neighborly ties with the regional countries, based on mutual cooperation and common interests, which were damaged by the Gadhafi rule for decades.